I’ve not had much experience with Lancôme products, but when I found the Clarisonic under my Christmas tree I was even more excited to find it came with a full sized Gel Éclat clarifying pearly foam cleanser. I’ve always wanted to try Lancôme but always felt it was a little out of my price range for daily skin care. The 125ml (4.2fl oz) tube retails between £20 - £25 which is an absolute bargain once you realize how little of the product you actually need. This tube will last an age. I’ve been using it daily for over a month now and it feels just as full as the day I got it. The cleanser itself, ‘pearly foam’ as Lancôme state, is just that. It comes out the tube as a white, thick gel with a pearly effervescent sheen. To me, it just looks expensive and high quality. It is perfumed, which I usually avoid, but it smells lovely. It has a light, fresh linen scent with rose undertones. It contains white lotus, rose de France and Japanese cedar bud, which explains the floral scent. This shot doesn't do it justice, but there are pearly flecks running right through the gel. Targeted at normal to combination skin, I was a little concerned it would be too much for my oily/acne prone skin, but I’m always up for giving new products a go. The gel cleanser turns to foam the instant you lather up – and a little goes more than a long way, about a pea and ½ sized amount is enough to completely cover your face and neck. I generally use this with my Clarisonic – and they go together perfectly. The Clarisonic loves thick foamy cleansers and Gel Éclat is just that – but it feels so light and fine on the skin, you’d be forgiven for thinking it wasn’t a gel at all! I was really surprised by the texture and consistency. After use, my skin is squeaky clean. It looks fresher, my pores appear smaller and thoroughly cleaned out. It melts make up and removes every last trace of waterproof mascara (though I recommend you use waterproof remover pre cleansing). This is one of the best cleansers I have used in a long time. Even when using it without the Clarisonic, my skin feels exceptionally clean. It doesn’t dry my skin out and it doesn’t make it greasy. If anything, my skin looks and feels matte for a long while after use. I have definatly noticed an oil reduction in the t-zone, and breakouts on my chin have greatly improved. I really have to avoid getting this in my eyes though as it stings something shocking! It recommends you use the cleanser twice a day – but I’ve been an evening only cleanser for some time now. I will, however, be introducing this to my morning routine and seeing if that changes anything. I would highly recommend this for normal, oily and combination skin. Sensitive skinned lovelies might want to pick up a sample at their local Lancôme counter first; the added fragrance might not be too kind to your skin. Dry skin might benefit from this as it’s pretty moisturizing but, as I said, my skin does feel really matte after use so it might not be as moisturizing as you need! I’ve been really impressed since first use – I’ve used a couple of sample cleansers from my subscription boxes and have found none so far that leave my skin feeling and looking as clean as Lancôme Gel Éclat! 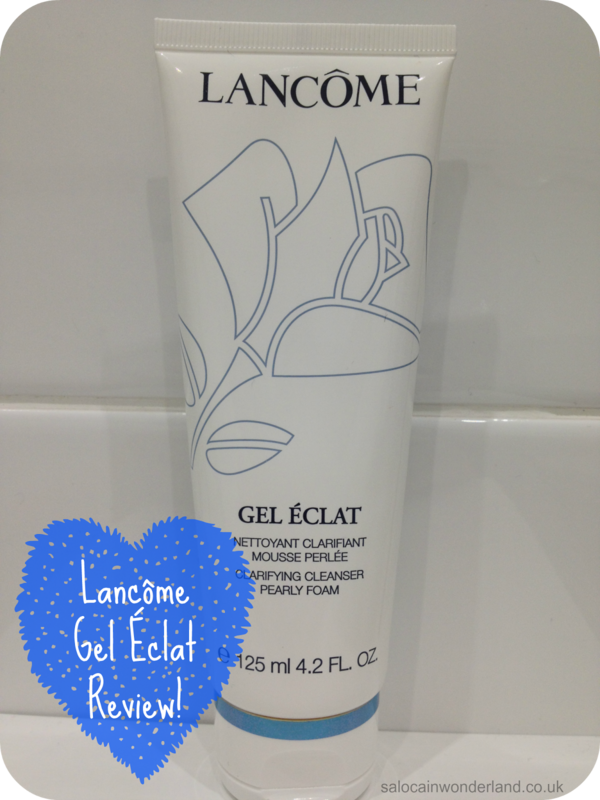 Have you tried Gel Éclat or any other Lancôme cleansers?